A blog about baking, books, and being awkward. 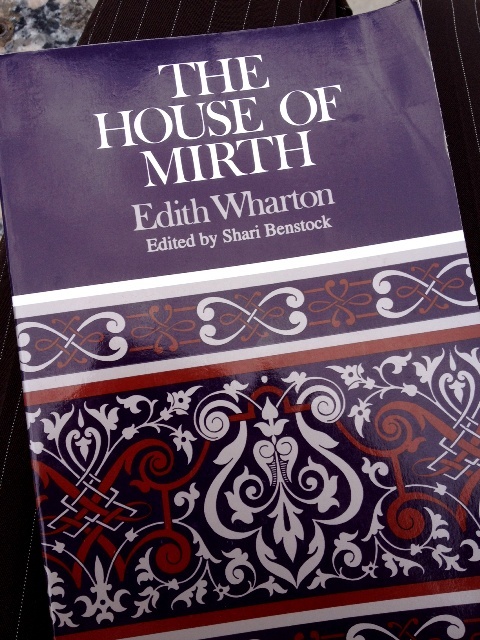 To continue with the loosely-applied “gender” theme of these literature posts, I present to you House of Mirth by Judith Wharton. Somewhere on the border of naturalism, with just a touch of realism for good measure, House of Mirth focuses on Miss Lily Bart and her social circle of rich New Yorkers in the late 1800s. Lily, however, finds herself pushed away from the center of this circle as it becomes more and more apparent that she doesn’t have the money to play cards every night and go vacationing nearly every week. She lives primarily off money distributed by her aunt, while she employs herself with finding a husband with enough financial security for her elaborate taste. In her late twenties when the book begins, her time is running out, yet she cannot seem to resist sabotaging her own chances at marrying. Unable to admit that she desires independence, at least to some extent, she must navigate treacherous social highways which seem to lead nowhere but disaster while overcoming the indecision that comes from being trapped between two unattainable lives. Though the story centers around Lily Bart, the opening scene depicts Lawrence Selden spying her and speculating about her from across a train station, and it prepares the reader for a novel intensely focused on social perception, expectation, and reaction. Rather than watching Lily learn to navigate high society, we find that she has already finely tuned her ability to manipulate both the men and women around her to the point where it’s arguably the art form Selden describes. Therefore, as circumstances change, we follow her fall from high society into Lily’s personal purgatory. To me, these ideas of influence and the power of choice are at the forefront of this novel, and this past semester, I wrote a paper about how Lily’s indecision stems from her inability to fully accept the life expected of her and her refusal to enter the working class. It is as though she is frozen somewhere in the middle of these two lifestyles, with too many mistakes and not enough self awareness to firmly step to either side. Personally, several things about this book drew me in, particularly seeing how Lily uses her manipulative skill to her advantage as her own type of social power, as well as the ongoing tension between Lily and Selden. They’re not perfect, but they’re adorable. If you’ve read this book before, what do you think is the word that both Lily and Selden discover after it’s already too late?